In my last post I described what happened when a company prematurely scales sales and marketing before adequately testing its hypotheses in Customer Discovery. You would think that would be enough to get wrong, but entrepreneurs and investors compound this problem by assuming that all startups grow and scale by executing the Revenue Plan. The Appendix of your business plan has one of the leading cause of death of startups: the financial spreadsheets you attached as your Income Statement, Balance Sheets and Cash Flow Statements. I got to see this first hand as an observer at a board meeting I wish I could have skipped. Spread out in front of everyone around the conference table were the latest Income Statement, Balance Sheets and Cash Flow Statements. The VC’s were very concerned that the revenue the financial plan called for wasn’t being delivered by the sales team. They were also looking at the Cash Flow Statement and expressed their concern (i.e. raised their voices in a annoyed investor tone) that the headcount and its attendant burn rate combined with the lack of revenue meant the company would run out of money much sooner than anyone planned. The VC’s concluded that the company needed to change direction and act aggressively to increase revenue so the company could “make the plan.” They told the CEO (who was the technical founder) that the sales team should focus on “other markets.” Another VC added that engineering should redesign the product to meet the price and performance of current users in an adjacent market. Given the tongue-lashing the VC’s were giving the CEO and the VP of Sales, you would have thought that selling the product was something any high-school kid could have done. What went wrong was that the founder had built a product for a New Market and the VC’s allowed him to execute, hire and burn cash like he was in an Existing Market. The failure of this company’s strategy happened almost the day the company was funded. There’s a common refrain that VC’s want to invest in large markets >$500Million and see companies that can generate $100M/year in revenue by year five. Enough entrepreneurs have heard this mantra that they put together their revenue plan working backwards from this goal. This may actually work if you’re in an existing market where customers understand what the product does and how to compare it with products that currently exist. The company I observed had in fact hired a VP of Sales from a competitor and staffed their sales and marketing team with people from an existing market. 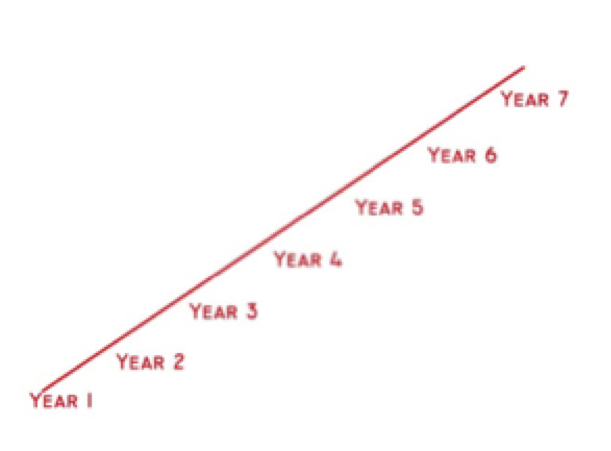 The VC’s had assumed that the revenue plan for this new product would look like a straight linear growth line. They expected that sales should be growing incrementally each month and quarter. Why did the VC’s make this assumption? Because the company’s initial revenue plan (the spreadsheet the founders attached to the business plan) said so. What Market Type Are We? Had the company been in an Existing Market, this would have been a reasonable expectation. But no one (founders, management, investors) bothered to really dig deep into whether that sales and marketing strategy matched the technical founder’s vision or implementation. Because that’s not what the founders had built. They had designed something much, much better – and much worse. The founders had actually built a new class of communication hardware, something the industry had never seen before. It was going to be the right product – someday – but right now it was not the mainstream. This meant that their revenue plan had been a fantasy from day one. There was no chance their revenue was going to grow like the nice straight line of an existing market. More than likely the revenue projection would resemble the hockey stick like the graph on the right. Companies in New Markets who hire and execute like they’re in an Existing Market burn through their cash and go out of business. I realized I was watching the consequences of Catch 22 of fundraising. Most experienced investors would have understood new markets take time, money and patience. This board had relatively young partners who hadn’t quite grasped the consequences of what they had funded and had allowed the founder to execute a revenue plan that couldn’t be met. Six months later the VC’s were still at the board table but the founder was not. Customers don’t read your revenue plan. Market Type matters. It affects timing of revenue, timing of spending to create demand, etc. Make sure your revenue and spending plan matches your Market Type. Make sure the founders and VC’s agree on Market Type strategy. I wonder how many startups have the luxury of being able to get a VC to understand and commit to a 5 year “New Market” strategy. I think the majority of startups figure out that unless they “get the money” they aren’t going anywhere anyway so they choose fighting it out at subsequent board meetings rather than never getting a second meeting during the fund raising process. In other words, I suspect most Series A fund raises are “Catch 22” affairs. The exception probably being “gold plated” entrepreneurs with amazing track records and the occasional “Google”-type idea combined with perceived very smart founder types. Great question. When you’re desperate for money you’ll take it from anywhere. The post points out that if you don’t realize what you signed up for you pay for it later. – Option 1, find VC’s who share the vision and understand market type. You may find out that your analysis of market type is wrong and investors may have a better insight. – Option 2, get the money from VC’s that don’t get market type – but ensure that you do. Spend the time educating VC’s (rather than fighting with them.) Make them part of the solution, not the problem. – Option 3, as in the example in the post, ignore the conflict between what you know in your heart it will take with what the plan you committed to. Deal with the consequences. Your interests and the VC’s are aligned (at least to get liquidity) so most will be interested to work with you to get the right plan. I would add Option 4 – figure out how to make and sell your product without requiring equity capital. Scale, profit and if you really need it in the future bring in capital on your terms. No one says it will be easy but you will have a much greater control over your destiny, subject to force majeure. Thanks for the common sense wisdom. Excellent post. I’m saving this one in the ‘startup founders need to read this before pitching VCs’ folder. I’ve been building financial models for startups for 10 years and still have not found a solution to the Catch-22. Even when we build a forecast as bottom-up as possible and using as much reasonable-ness as possible, there is still the perverse tendency to ramp up to somewhere near $100m in 5 years. I think Joe’s comment hits it on the head– although most founders know such revenue ramps are pretty much fiction, selling this fiction at least buys the *possibility* of hitting the forecasts, whereas forecasting too low (and not getting funded) means the probability is automatically zero. I also agree with you, Steve, that most models are built for an existing market curve, whereas most startups are really selling into a new market. But again, there is an underlying bias toward getting to cash flow breakeven within 2 or so years; if we truly modeled 4 years of Death Valley followed by a hockey stick ramp, most investors would hit the eject button pretty quick. 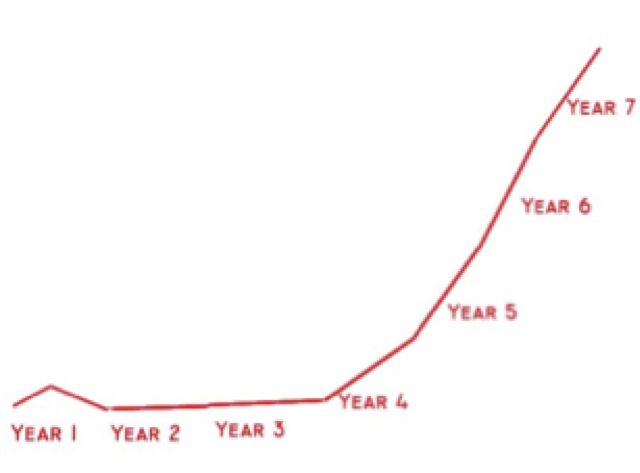 I do think many founders can do a better job of managing expectations early on– once you’ve got an investor hooked, there is usually a small window prior to closing the round– the ‘honeymoon period’ so to speak– to layer on the caveats (aka “are you sure you want to do this deal? keep in mind that….”). The financial model can help in this regard, by putting some ranges around the downside risk– such as cumulative negative cash flow if sales ramp much slower or if we need to double marketing spend. I’m working on an article for my blog seedstagecapital.com that will focus on financial modeling for startups– namely, how to bring reality to what is mostly an exercise in fantasy; I’ll post a follow up comment when it’s up. Perfect description of a #1 cause of death–as soon as the business plan is written it suddenly becomes fact. I think one major flaw in the way we teach entrepreneurship is that most basic entrepreneurship classes are, at their heart, business plan classes. But once the BP gets written, then students become really dangerous because they begin to act on “the plan.” The same is true for many entrepreneurs. In the course I teach, most students have been through a basic business plan course already and in many ways I feel I have to reducate them: I first validate that BPs can be useful but that they now need to throw away most of what they’ve written down. An interesting study would be to measure entrepreneur confidence before the business plan and after the business plan and show what must be the sudden commitment to the plan. What would be the ultimate follow-up would then be to show how the revenue projections didn’t in fact work out. So, what happened with the new SilverBullet CEO? Did he bring everyone around to reality, dump the salesforce until they could get a repeatable sales process, etc.? Follow the board’s “pick another direction to shoot blindly in” approach, or something else? how do you determine what type of market (new or existing) your product is positioned for? Great post, and great comments. Frequent communication with the investors can help make this easy. I read an article on this but can’t recall where.